A Special School in Leominster was one of the first winners of our Centre of Excellence Awards. 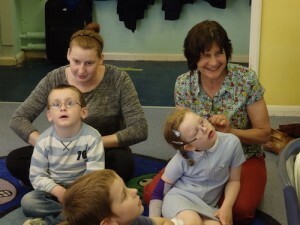 We share the many uses and benefits of Story Massage at Westfield Special School. Westfield School is a maintained Special School for 50 pupils with severe or complex learning difficulties within the age range 4 – 19 years. Nicky Morris, teacher in Hedgehog Class researched the benefits of Story Massage as a way of exploring through play. 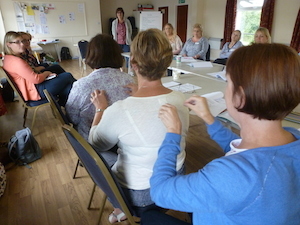 She then attended a Story Massage training day with three other member of staff, Zoe, Denise and Sarah. They could immediately see the benefits and worked together to draw up a plan of implementing within the school. The school continues to use Story Massage on a daily basis. One young boy can now sleep at night if he has a Story Massage at bedtime. His parents are very grateful. 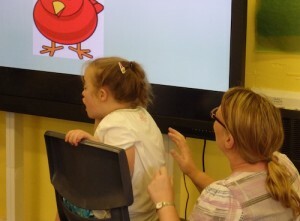 Another child who is tactile defensive has gradually started to accept touch after being introduced to Story Massage. He is now happy to accept touch in other situations too. Several sixth formers are learning about appropriate and safe touch, and building respectful relationships, through using Story Massage activities. They recognise the need to ask permission and to listen to feedback on levels of pressure. One young girl has visual dyspraxia and Story Massage has helped her concentration and engagement with story books. Another young boy with autism has verbal dyspraxia and has gradually started to read the story at the same time as the massage takes place. This has boosted his confidence and self-esteem. For several children with autism the combination of words and touch has helped them to remember a sequence of events, actions or words. Some of the students now massage each other which is a massive step forward in a school like Westfield. 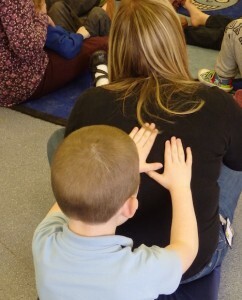 Following on from the assembly, the older children began practising Story Massage in their classes so they could help out with the session in Nicky’s class – Hedgehog Class (4 to 8 years). They learnt the importance of sharing positive and respectful touch with each other and the actions and names of the ten basic Story Massage strokes. 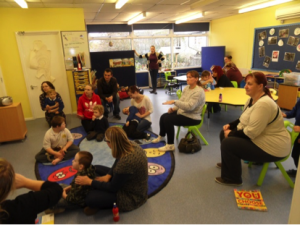 Nicky, Zoe, Denise and Sarah came up with the idea of introducing Story Massage to the parents as part of a ‘Read with Me’ morning when parents are invited into the school to share stories with the children. Nicky demonstrated the moves and the parents joined in. 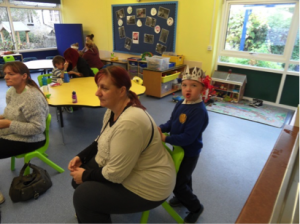 There was lots of positive feedback from the parents who asked to be kept up to date with Story Massage activities in the school. All the pupils now enjoy using Story Massage as part of regular assemblies and in the classroom. Last term the whole school theme was ‘What’s in a Book?’ and Hedgehog Class focused on a new story each fortnight. 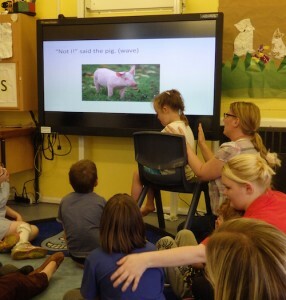 Nicky put together a Powerpoint for several different stories including Jack and Beanstalk and The Little Red Hen. Parents were given a copy of the stories and invited to share massage with their children at home. Nicky and her team have also created several social stories for the pupils to help prepare them for events such a transition to a new class. They have also written this massage story for a child who finds it hard to go to bed at night. The story is written to be personalised, so exchange Westfield for a child’s name. Hedgehog Class ends the day with a Story Massage session at 14.30 as part of their regular routine. The children were are playing outside are always keen to get back to the classroom as soon as they were told it was Story Massage! Everyone joins in. Some were actively involved in the massage and enjoyed receiving the strokes or giving massage to members of staff. Others preferred to sit and watch the pictures, say the words aloud or make the actions in the air. 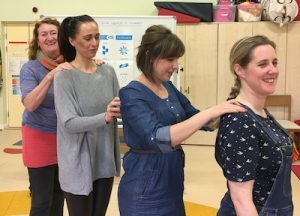 Could Story Massage benefit YOUR Special School? If you work in a Special School, then do consider our training options. We run courses at venues around the country and offer in-house training sessions at your school. Please contact us for further information. Story Massage Training.